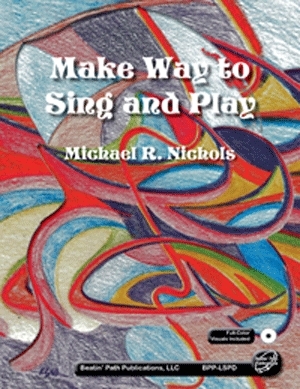 HARRISONBURG, Va. - Aug. 8, 2013 - PRLog -- Fourteen brand new new arrangements and original songs are presented in this latest book by Master Orff Teacher, Michael R. Nichols. This book continues in the style of his last book, Let's Sing and Play a Dozen. With complete lesson plans, full Orff instrument orchestrations and a part in every song for the Soprano Recorder, these activities are a wonderful way to reinforce valuable skills students are learning in grades 3 - 6. Make Way to Sing and Play includes a CD ROM with full scores in landscape mode for easy projection on your whiteboard and instructional visuals presented on full-color slides. Each visual is also presented as a .pdf file for easy printing. Students will love to sing, dance, and play these sparkling songs and arrangements. Suggested retail price for this new book is $29.95. Dealer Discount is 40% on any quantity with payments due in 60 days. Available Now!